Did you know that separation anxiety is one of the reasons many dogs are euthanized or given up by their owners. 1. The number one cause of separation anxiety is a human’s lack of leadership. We humans, more often than not, tend to treat our canine family members like humans. In a pack, the leader is allowed to leave. However, the followers never leave the leader. 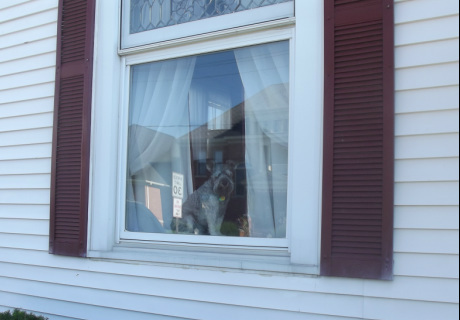 If your dog is instinctually seeing you as his follower and you leave him, it causes so much mental anguish that a dog often takes it out on your house or himself. The dog sees himself as the one who is responsible for the pack and when the pack has left the house he gets in a panic because he is afraid that something might happen to his pack members, for whom he is responsible. When a dog accepts you as pack leader separation anxiety will not exist. If you do not understand the instincts of the dog and his pack members, the articles on this page Understanding Dog Behavior will give you a better idea of how your dog instinctively thinks. However, the issue of separation anxiety is not always solely one of a leadership issue. 2. Separation anxiety can also be due to a lack of exercise. A build-up of energy stored within the dog can bring about multiple behavioral issues. When you leave, it intensifies her stress and she acts out because she does not know what else to do with this built-up energy. Walk your dog in the morning before she eats and again at night. For the walk to be successful, your dog needs to be focused on her owner, the pack leader. Therefore, the dog should not be pulling in front of you. The dog should be walking beside or behind you, following YOU, as opposed to you following HER. If you allow the dog to pull in front, you are once again re-enforcing to your dog that she is alpha over you. Instinctually, the pack leader goes first. If you do not make your dog heel beside or behind you, the walk will not accomplish its intended goal. When a dog walks with her mind focused on her owner, she releases both physical and mental energy. This works her brain and fulfills her canine instinct, but also relieves them of the responsibility of having to provide leadership in a human society, which the dog is really not equipped to do. I suggest you buy some of Cesar Millan DVDs and watch them. The money you invest in these DVDs will be less than your dog’s future destruction and anguish. 1.Is your dog getting enough exercise? Are you spending enough time with him? Have there been major changes lately? These and other questions should be asked and addressed. Sometimes it is just a small thing that makes the difference with controlling this problem. Do you provide pack walks? Be sure you take your dog for a long pack walk before you leave for any extended period of time in order to drain his mental and physical energy. 2. Are you your dog's pack leader? Or is your dog your pack leader? Read the articles on this page Understanding Dog Behavior. 3. When leaving the house, don’t make a big thing out of it. When you come back, do some other things first, like taking off your coat and putting the groceries away, before you greet the dog. You want to avoid the dog getting the impression that leaving is a big deal. Saying goodbye to a dog is something that helps the human deal with the separation, but in reality the ritual of saying goodbye means nothing to the dog. It's all for the humans. You want the dog to think that your leaving is just part of the routine. If you feel bad about it, your dog will "feel it" and it will upset him. Read The Human Dog to understand why. 4. Sometimes getting a second dog will help your dog cope with his human pack leaving him. You may still want to crate your dogs while you are gone, however having the crates close to one another can ease your dogs’ tension, as they will not be alone. Just be sure you are the pack leader to your first dog before you venture into getting a second dog. If you successfully position yourself as the pack leader to the first dog, he will help you teach the second one the house rules. 5. If you have more than one dog, and you do not know which dog is being destructive, you need to play private investigator. Peeking through a window or setting up a camcorder or two will help you find out who the perpetrator(s) are. 6. You may need a new attitude. From now on you are not going back in the house when little Fifi cries. You are going to ignore the bad behavior and reward the good. When you go back and hold her or pet and console her, you are rewarding the behavior that you don't want and it is confusing to your dog because she thinks, "Well, I must be doing the right thing if she comes back and praises me." 7. Do practice departures. Leave for 2 minutes; come back in; ignore the dog for a minute or two, then give a treat. Increase the time to 5 minutes, then 8 minutes, and so on. Do not reward bad behavior.